Background: Cancer subtype identification is an active research field which helps in the diagnosis of various cancers with proper treatments. Leukemia is one such cancer with various subtypes. High throughput technologies such as Deoxyribo Nucleic Acid (DNA) microarray are highly active in the field of cancer detection and classification alternatively. Objective: Yet, a precise analysis is important in microarray data applications as microarray experiments provide huge amount of data. Gene selection techniques promote microarray usage in the field of medicine. The objective of gene selection is to select a small subset of genes, which are the most informative in classification. 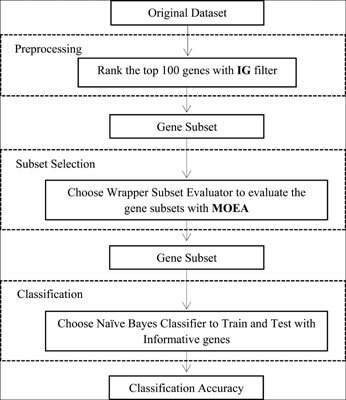 Method: In this study, multi-objective evolutionary algorithm is used for gene subset selection in Leukemia classification. An initial redundant and irrelevant gene removal is followed by multiobjective evolutionary based gene subset selection. Gene subset selection highly influences the perfect classification. Thus, selecting the appropriate algorithm for subset selection is important. Results: The performance of the proposed method is compared against the standard genetic algorithm and evolutionary algorithm. Three Leukemia microarray datasets were used to evaluate the performance of the proposed method. Perfect classification was achieved for all the datasets only with few significant genes using the proposed approach. Conclusion: Thus, it is obvious that the proposed study perfectly classifies Leukemia with only few significant genes. Keywords: Classification, gene selection, microarray, multi-objective evolutionary algorithm, redundant and irrelevant gene, significant genes. Keywords:Classification, gene selection, microarray, multi-objective evolutionary algorithm, redundant and irrelevant gene, significant genes.